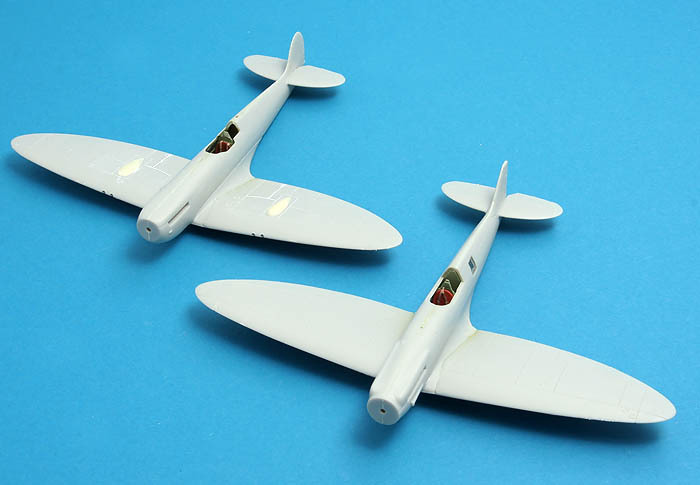 AeroScale :: 1/72 Airfix Spitfire pair - IX and XIX! 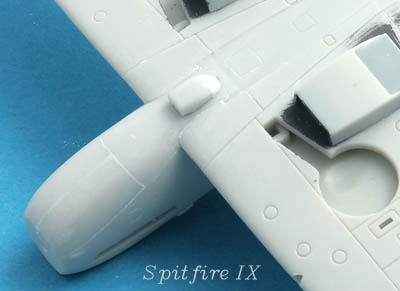 1/72 Airfix Spitfire pair - IX and XIX! Here we go again - two more Spitfires bypassing the build que! 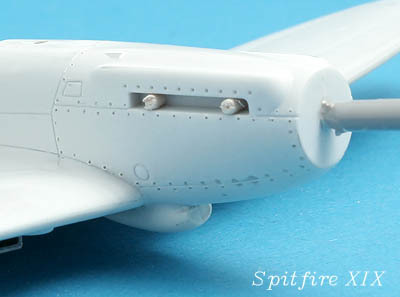 This will be a twin thread detailing the builds of those two Airfix kits. 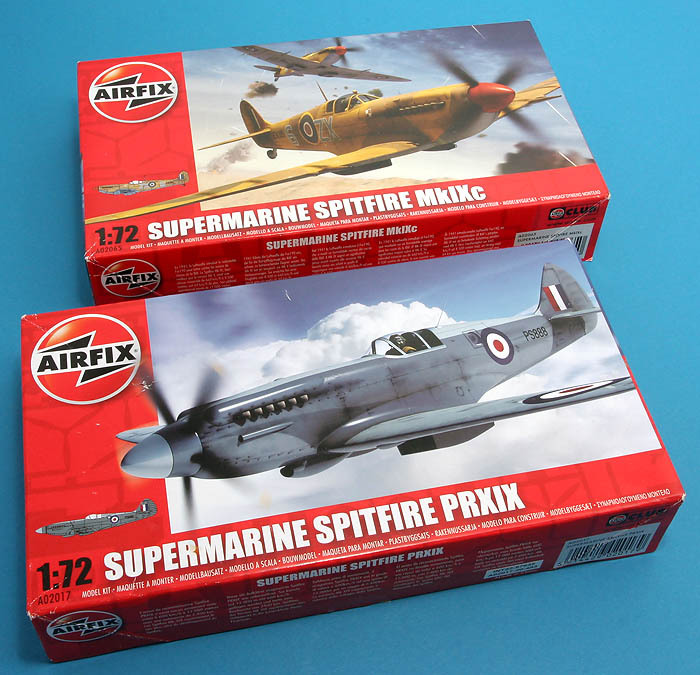 To set the record straight from the beginning: as far as I can see those have nothing in common with any earlier products from Airfix of any other manufacturer. They are completely new releases. For a look what's in the box of the Mk XIX, have a look here. The Mk IX has been reviewed here. Actually the very kit I am building, thanks Martin! The kits are quite different. In an ideal world, the best parts from each of them merged together in one kit would mean an excellent Spitfire. What we get now are two perfectly acceptable kits. They aren't great in any way but pricing is very competitive and they certainly have their strengths! The Mk IX is the weakest when it comes to detailing: there is no interior whatsoever in it. 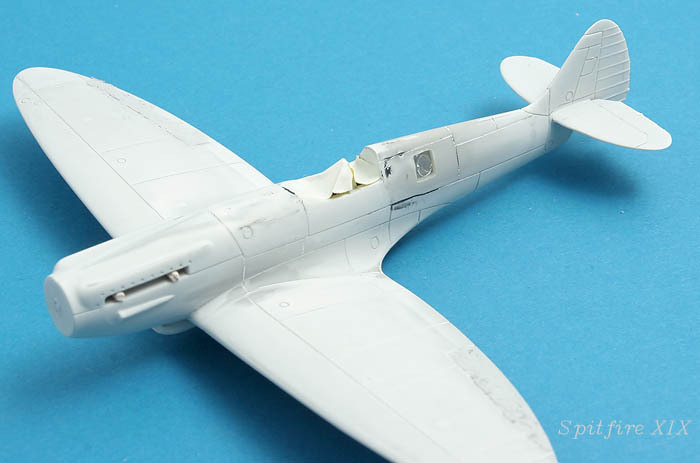 I have addressed this by making resin copies of various Spitfire bits and pieces I have in the scrap box, with a few bits of plastic stock I will get an acceptable interior! 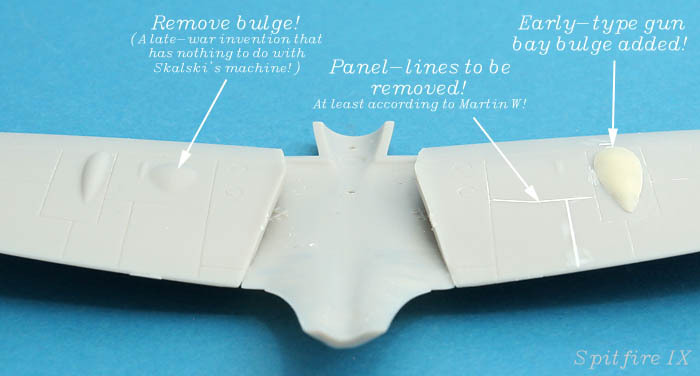 Since Martin who handed me the kit hails from Poland, I have no choice other than to build Stanislaw Skalski's aircraft which immediately results in another problem: Skalski's Mk IX had the early broad breech bulges on the wings while the kit has the more common narrow ones. 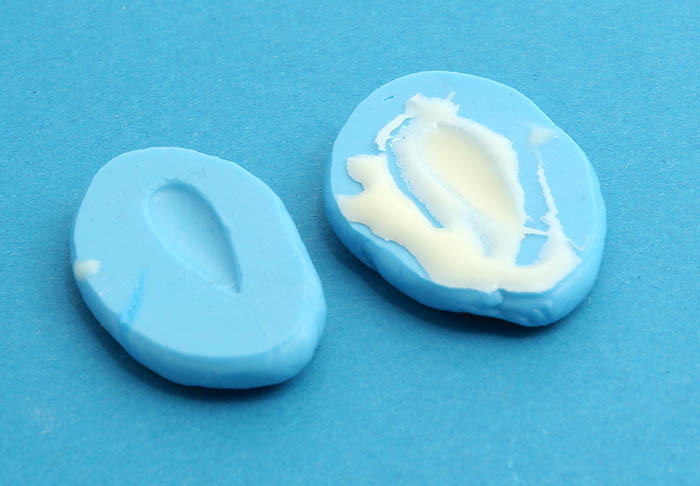 Resin casting came to help with this one as well: I made silicone clay moulds from a Ventura kit (that comes with the broad bulges) and cast resin copies. 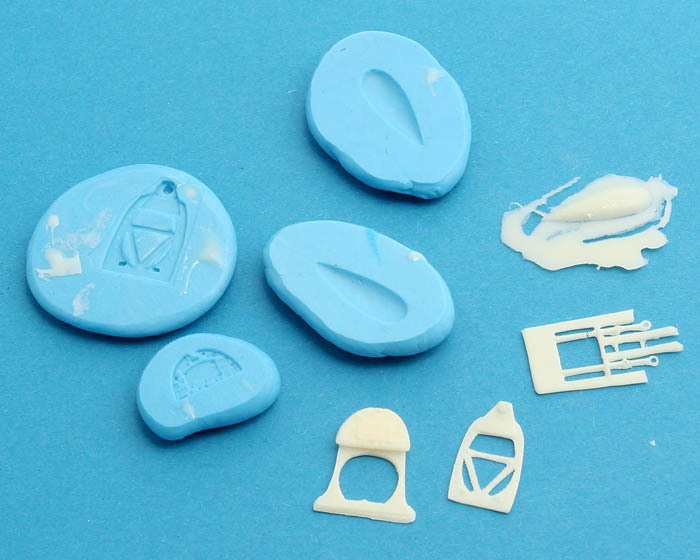 Silicone moulds and resin bits and pieces! A set of breech bulges. 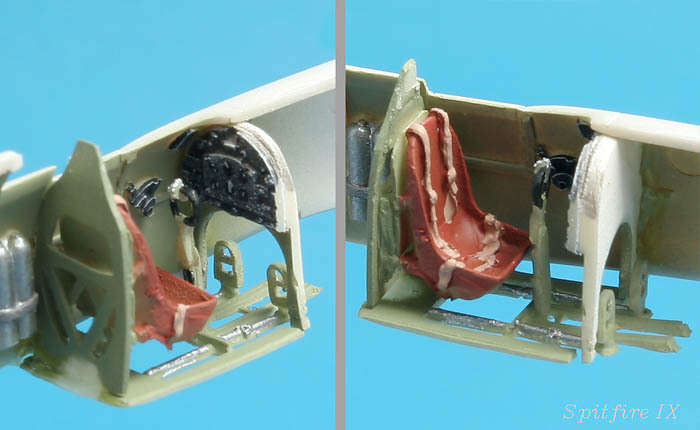 Mk XIX interior, most parts from the kit but complemented with a resin instrument panel and etched seat belts. The seat really should be exchanged for something better, we'll see where it ends! Magnus, you are a master! No-one can make the best of a imperfect kit like you can. Can't wait to see the results of this. 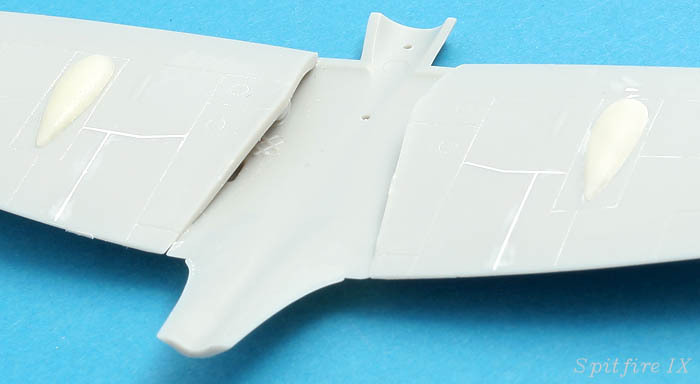 The shallow-moulding of resin parts like that is great for the thin instrument panel and the bulges- I had not realised that was possible. I had considered a kit-bash of the wings from the XIX onto the rest of the IX to make a PR IX, but I have a lot of other kits calling! Have you chosen the markings for the XIX? There are quite a few interesting post-war ones- one used from Hong Kong, I remember. Magnus, I can see you now, walking along the shelves at the LHS . . . and I quote . . .
"That's too easy, that's too easy, that's too easy . . . now this looks like it will never go together, I'LL TAKE IT !!" As usual Magnus very interesting theme...especially that I see you build a Stanislaw Skalskis' machine...if you will need any information write me a PM, I'll try to help you as much as possible. Oh, the humanity! Why do you always go for the most complicated builds? Are there no "straight from the box" spitfires? I look forward to the end results. Which marking for the XIX? 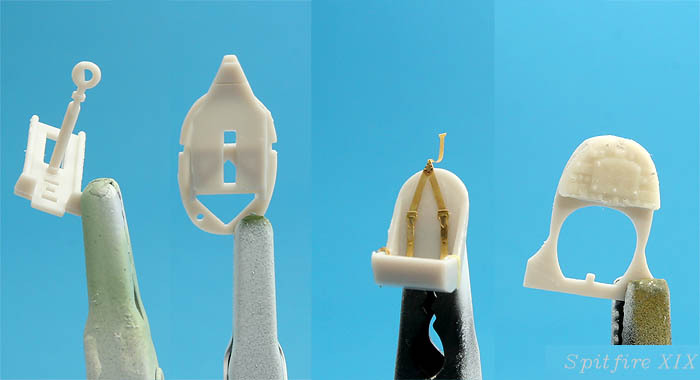 Have you considered the Pavla detailing sets, or is that too mainstream? Ps. I might be going to Copenhagen within the next few weeks (Stoppel), but not until after the climate conference is over. Send me a message if you still need help! ..as Martin says in his review at the Spitfire site I've bought 'em & built 'em and enjoyed it..
..both are really quite neat, especially the PR XIX. The lack of cockpit detail in the IX was a disappointment ..great idea to just copy the other kit parts.. I also found the canopy was a little flat again Magnus..
..only 'problem' on the XIX is the fuselage camera port which is positioned a little too high up on the fuselage (a millimetre or 2 - a little bit critical if doing a post-war scheme with the colour demarcation along the top of the port) and it also has rather anemic exhausts..
..web sites that might come in handy for the PR. 19..
RAF Seletar (Malaysia) Assn site - hunt around for PR XIX pilot Peter Giddens' photo album.. This thread has been quiet for a time now, time for a change! Thanks to all of you for your kind comments and especially to Michal for offering to help (Uwaga! ) and to Neil for that collection of excellent references! And the XIX, this one is as it comes from the moulds! ...and after a serious airbrushing session! ...and both models very quickly completed! Some sanding and then it is primer-time! I have the PR19 in the stash and it should be the first model of the year after the examination session and when the weather improves. Did you experience any fit issue? I have seen a built review video and it seemed there was a big step when attaching the wings to the fuselage on the underside. Nick! Thanks, I'll do my best! Giacomo! 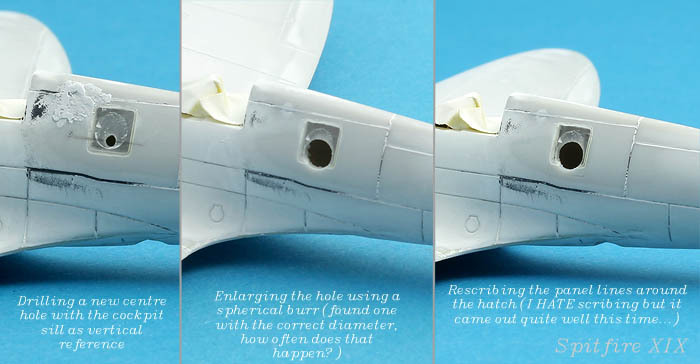 I didn't get that perfect wing-to-fuselage fit either, there was a slight vertical gap. 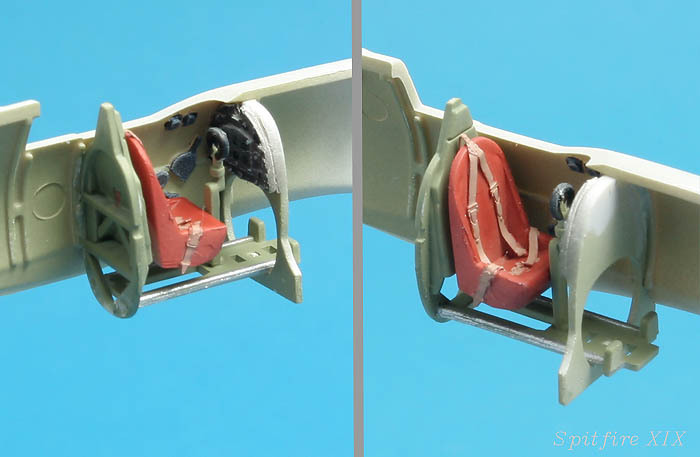 I filed down the interior bulkhead a bit as per the photo below! 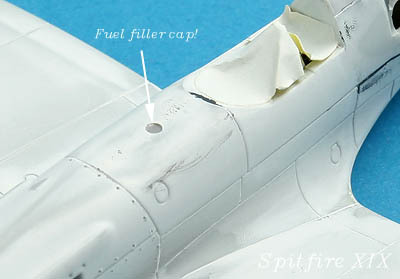 Wing joint isn't perfect on any of the kits, the usual trouble-spot on Spitfire kits! I'm off to the workbench now to fix that, I have an evening of sanding before me! Both kits flew through final assembly plant with a minimum of fuss, they have been primed and are now undergoing routine maintenance for the usual minor flaws always found after the first coat of primer has been applied! Carburettor intake was modified on the Mk IX. The original kit part might be OK for the long version while the short version doesn't look like anything I have ever seen under the chin of a Spit! My interpretation is just that - an interpretation! It is very hard to find good photos of what this early intake really looked like, especially since the slipper tank that hides most of it seems to have been en vogue when the Spit IX was first introduced! On the contrary, there are innumerable good photos of the long intake! Camera hatch didn't fit that well so I filled it in using superglue and will rescribe and drill a new opening in a hopefully more correct position (window is a bit high on the fuselage!). I also found some sink marks in the ailerons that I'll better fix before proceeding! Hi Magnus! I love your take on "MAD"-level! Keep it up! Am I to understand that you're building a non-Swedish PR XIX!? Is that allowed? Nope it isn't but since I have "anarchy" written all over me I don't care ! And, by the way, I gave you the only decals I had for a Swedish Mk XIX ! Ant! Since you point it out I suppose I'll have to do something about the filler caps at least ! As for the rivets I haven't decided yet! I agree with you that the kits could have been a bit more refined but I appreciate the "feel" of them, they are really Spitfire-like in their overall shapes. Detail-wise they could be a lot better but that is on the other hand a lot easier to fix! Fixing the camera hatch... If it had fitted better I think I would have left it the way it was but since I had to mess around with it anyway I could as well move it! Magnus, just a question... which colour are you going to use to depict the PRU Blue? I THINK I will use an old Aeromaster Acrylic (the ones that were made by Polly S) PRU blue, maybe with a drop or two of Azure to make it a bit bluer. I'll let you all know when it comes to painting (not too far into the future, maybe already during the weekend). Cowling fasteners look great Magnus- were they made with a 0.3mm drill (look a bit smaller than that), or a pin or something similar? Ben! Fasteners were simply pressed in using a sewing needle in a pin wise. To get them reasonably along a straight line and equidistant I used a piece of Dymo tape. I laid the Dymo tape along a ruler and cut notches in it every 2 mm. I have seen ready-made steel rulers with equidistant grooves along the edges for this kind of work but this worked equally well! Since several pilots made ace in this machine, I suppose it had a gun sight. 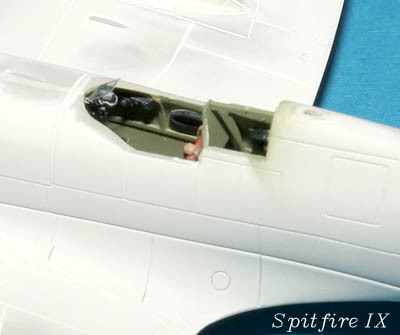 I have also heard that many pilots favoured Quickboost sights instead of the Airfix originals !